One half-mile from I-84 and offering free Wi-Fi the Rodeway Inn Milford provides budget-friendly convenience near the Delaware Water Gap National Recreation Area. 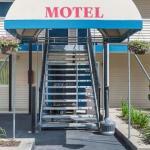 The two-story Rodeway Inn has 26 rooms featuring free Wi-Fi and premium cable TV. Non-smoking rooms are available. Guests are entitled to free local phone calls during their stay as well as complimentary at-your-door parking. Pets are permitted for a fee with restrictions. The Rodeway Inn is less than two miles from downtown Milford in northeast Pennsylvia's Pocono Mountains four miles from the Delaware River and the New Jersey border and 11 miles from Port Jervis N.Y. The inn is 75 miles west of Manhattan. The north gate of the Delaware Water Gap National Recreation Area is a short drive away. It's 10 minutes by car to Twin Lakes 10 miles to New Jersey's High Point State Park and 11 miles south to Dingmans Ferry. Stewart International Airport in New Windsor NY is 45 miles east.